A familiar favorite among Safari users, Inquisitor (which was acquired last year by Yahoo) recently made its way to Firefox and Internet Explorer. 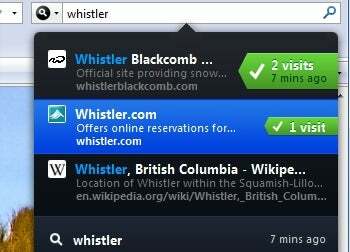 All you do is install it, restart your browser, and then start typing in the search field like you normally do. Now, however, each keystroke brings search results, suggestions, and shortcuts to other search engines. All this appears in a slick-looking black box, which is enhanced with search-history flags that help you quickly zero in on sites you've visited before. Though it's not surprising that Inquisitor makes Yahoo your browser's default search engine, it is rather annoying. Fortunately, you can switch back to Google (or whatever) if you prefer: Just click Search Options at the bottom of an Inquisitor results list.